A new book focusing on the tactics and strategies of the best online sellers has been announced by Martyn Cook, called 1% Secrets. It is designed to help more businesses achieve success online. 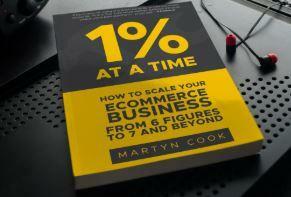 Martyn Cook has announced the launch of 1% Secrets, a new book designed to help online businesses and stores achieve success in today’s competitive environment. The book showcases the SEO strategies and lead generation tips used by the best in the business to improve web presence. Customers can help their audience level up their online store and improve web presence in a variety of ways. This is ideal for entrepreneurs in the marketing niche looking for new ways to help their clients grow and succeed. The team behind 1% Secrets has a genuine passion for helping other succeed, and it’s this driving force that is behind the launch of the book. They believe that the book will help to change the online landscape for the better, giving more stores a chance to grow and be the best they can. With 1% Secrets, marketers and entrepreneurs can showcase to their clients how to improve lead generation and grow their business through high quality SEO. Lead generation supplies them with the hot leads they need to gain more customers, regardless of their product line. This is the driving force behind the success of any online business, and is imperative to master as early as possible. This is because business expansion is directly linked to finding new clients and turning visitors into paying customers. For many site owners, SEO, digital marketing and inbound lead generation techniques can seem alien and even scary. This is where 1% Secrets can help, by breaking down the aims, goals, routines and strategies of the best in the business and showing them in easy to understand language. This type of information is especially important in today’s market, where research shows that most consumers don’t get past the first page on a Google search. Using 1% Secrets, store owners can learn how to dominate their competition and achieve success.